Kolkata: A fake medic, identified as Sanjib Chaki, has been held by the city police after relatives of a 19-month old girl, suffering from cold and cough, died hours after being administered an injection at Ultodanga under Manicktalla police station in north Kolkata. Goury Naskar was suffering from common fever with symptom of cold and cough since July 24. When her condition deteriorated she was taken to the medic on Wednesday and administered an injection. Since then her health worsened and she died last night at the state-run RG Kar Medical College and Hospital.The aggrieved parents and relatives accused Chaki of medical negligence and took him to the Manicktalla police station. 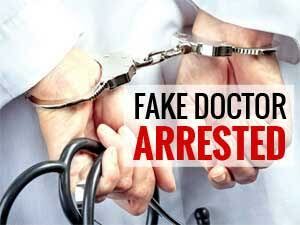 Police investigation revealed that he was fake doctor as he could not produced any document of being a qualified doctor. Police would produce him in a local court for further remand.